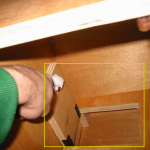 How to Build a Cheap Secret Compartment – Using a magnetic lock and concealed hinges, this tutorial shows you how to make a cheap secret compartment in the base of a bookcase, cabinet or other furniture. The door doesn’t have an obvious handle to open it and can be placed in an inconspicuous location. 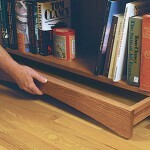 This one uses the toe kick area of a bookshelf for secret storage. The method could be applied to vertical panels as well. 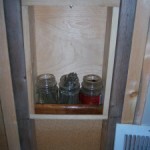 Air Vent Drop Down Compartment Wall Safe – You’ll have to scroll down on this forum post, but user DangerMouse builds an awesome secret compartment in his wall, that drops down for access. When not in use, it slides up between the studs and locks in place with magnets. There’s a hole cutout in the drywall near the bottom of the wall for access. To cover the hole, DM uses a a standard metal air vent grate. While this isn’t a step by step tutorial, there are enough pictures to let you know exactly how to make a hidden compartment wall safe like this for yourself! Building Secret Spaces – I’m hesitant to include this link with the others since it isn’t technically a how-to article, and you have to pay to view it. However, the picture of the secret, under bookshelf toe kick drawer is too cool not to list. 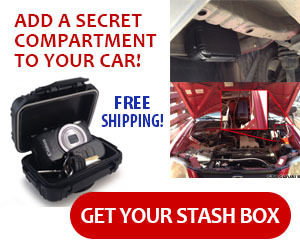 The article does display some great examples of secret stashes including some false-bottomed drawers. It’s from Fine Woodworking magazine, so is geared towards people who already have the woodworking techniques down pat. Hidden Drawers – This is an excerpt from The Complete Illustrated Guide To Furniture & Cabinet Construction. Again, this isn’t a complete how to article, but the illustration and craftsmanship was so good I felt compelled to post it here. If you have the talent and the tools to build furniture already, use this for inspiration and ideas on how and where to incorporate secret compartments into your creations. 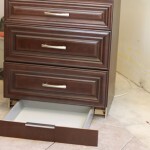 Tradewind Tiaras did a piece here on building a secret compartment drawer in the toekick of a new cabinet install. She uses 7 pictures and several steps so you can see the details involved in this project. Normal drawer railas are attached to the front of the toekick so the final drawer is almost undetectable unless you know it’s there ahead of time.